Your body naturally produces a substance called "glucosamine" from glucose and amino acid glutamine. Your body uses this glucosamine to lubricate and cushion joints and cartilage, facilitating movement. Sometimes, however, the body doesn't produce enough glucosamine on its own. Or, as is the case with people with osteoarthritis, the cartilage begins to break down, wear away or grow thin. Athletes and other people who tend to overuse their joints also suffer from deteriorating cartilage. 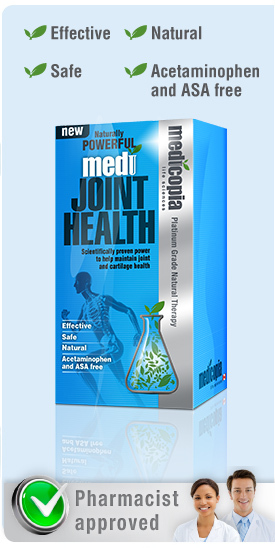 Naturally powerful MediJoint Health™ from Medicopia™ was developed to help you improve the overall health of your joints and cartilage, reducing any pain you may have now and preventing future pain. Only MediJoint Health contains Platinum Grade glucosamine hydrochloride (HCl), the finest glucosamine HCl available, making MediJoint Health a safe, effective, natural joint health medication. Next >> How can you keep your joints healthy? 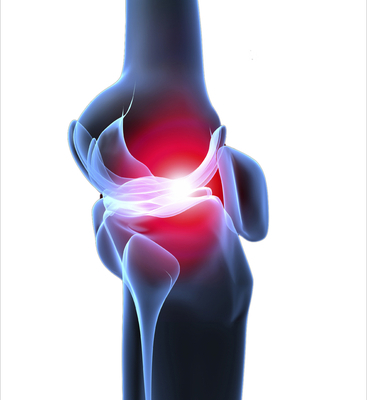 << Previous Why is joint and cartilage health so important?